WHY CHOOSE OUR SALT ROOMS? Here at metta, the duration of the salt therapy session for kids is 30 minutes, and for adults – 40 minutes. According to the latest scientific publications by leading Russian scientists, this is the optimal time to achieve healing results. We have bidirectional, forced ventilation with a five-fold change of air in the rooms after each session, a system for drying and purifying the air in the rooms from airborne microorganisms as well as a humidity control system since higher room humidity can cause side effects in people with allergies and asthma. Our salt rooms are saturated with negative ionized sodium chloride particles with sizes of 1 to 5 microns and in concentration of up to 5 mg / m3. We control this automatically with Professor Gorbenko’s Third Generation Halogenerators which use the fluidized bed technology. We have also added infrared radiation that normalizes blood pressure, improves and stabilizes blood circulation, has a beneficial effect for back and muscle pain, bronchitis, asthmatic conditions, helps with colds and ear, nose and throat inflammation, as well as in cases of fatigue and exhaustion. 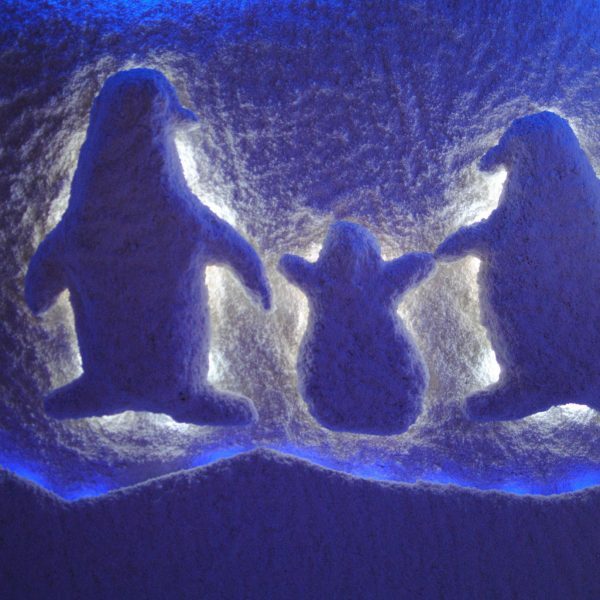 In our salt rooms we use AEROGALITE – a substance made of rock salt using a special technology. It is extracted from 400 m below the earth’s surface, then sterilized and hermetically packed in glass vials. We do not have TVs or other electrical appliances in the salt rooms. We do not expose our visitors to harmful frequencies, do not subject them to electromagnetic pollution, and do not saturate the air with positive ions. DRY salt aerosol is a must. Research shows that only dry aerosol has a positive effect on human health. The saturation of particles with sizes of 1 to 5 microns is not less than 85-90%. This is precisely the amount that affects the airways of the respiratory tract. The walls and ceilings of our salt rooms have a multi-layer coating of rock salt which is an important element in creating a healing microclimate. This coating has three main functions: medicinal, protective and it also serves as a buffer. The healing and protective functions are related to its antibacterial properties since it creates an almost sterile environment. The coating is also a buffer which stabilizes the dry powdered ionized aerosol and prevents the adhesion of its particles that could happen due to moisture released by breathing. Our halogenerators comply with safety standards and have passed multiple tests, registration and certification procedures. 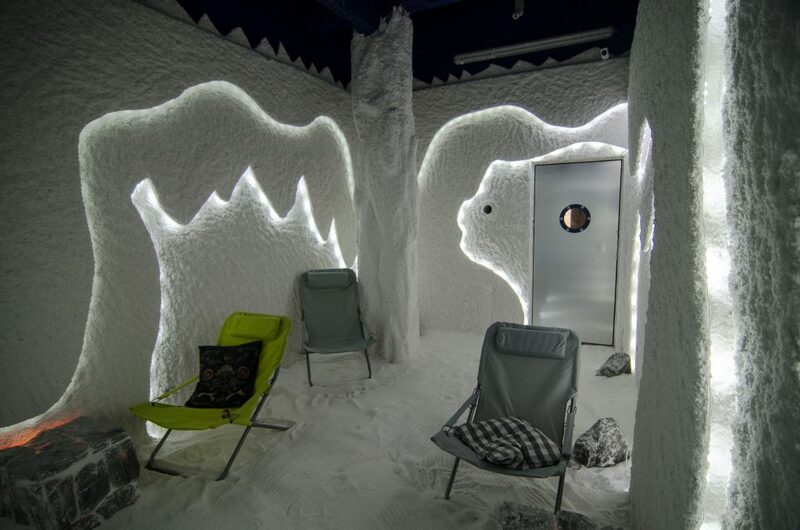 Modern-day halotherapy began developing in the 19th century, when the Polish doctor Felix Boczkowski noticed that salt miners did not suffer from the harsh conditions of their work. After years of research, the first pulmonary salt hospital opened in that very mine in Poland in 1959. In 1984, at St. Petersburg’s Aerosol Medical & Aerospace Center a team under the scientific leadership of Professor P. P. Gorbenko created the world’s first salt room, whose purpose and idea was to recreate the micro-climate of the salt mine in an urban environment. In 1988, Gorbenko and V. F. Salsarenko created the halogenerator technology used to saturate salt rooms with dry aerosol. The modern halogenerator produces ionised aerosol using a so-called “fluidized bed”. The substance AEROGALITE is made of high quality rock salt, mined at an average depth of 400 m.
Despite all scientific efforts, the healing effect in the salt rooms could not achieve the level that had been observed at hospitals in former salt mines. The halogenerators, highly ionized sodium chloride and saline coating on the walls had indeed achieved a significant improvement in the condition of patients with asthma, chronic bronchitis, psoriasis and various other complaints, but something was missing. Scientists called this the X-factor riddle. After 20 years of research and with the direct involvement of Professor Gorbenko, the absolute sodium chloride crystals’ transparency for long-wave radiation was discovered. The secret to the effectiveness of salt mines was revealed: due to the chemical purity of sodium chloride crystals, infrared radiation with wide range and high power is directed from the bowels of the Earth towards its surface. This powerful flow of quantum energy concentrates in salt caves and has a strong energetic, biophysical, and biochemical impact on humans. In 2003, Professor Gorbenko patented the “Quantum Energy Salt Rooms”. His discovery brought the halotherapy to a new, higher level. Infrared radiation is electromagnetic radiation generated when ions or atoms emit photons while changing their energy levels (coming back from excited to ground state). The length of infrared waves is from 0.7 to 350 μm. In the electromagnetic spectrum they occupy the space from the end of the red area of visible light to microwave radiation. Besides the Earth’s core, the other largest infrared-emitting object is the sun. When they penetrate the body, infrared rays heat up the muscles and tissues to a depth of up to 4 mm. This feeling could be detected most strongly in cold winter days and clear sky, when the sun is shining and we feel warm despite the cold air surrounding us. Salt particles below 3 microns penetrate the skin and the mucous membrane and speed up the lymphatic flow. This activates metabolism and expulsion of toxins. The quantum-energetic salt room can also be used for detoxification because it helps to clear the body from accumulated poisons. Salt rooms and infrared radiation strengthen the immune system. They alleviate the symptoms of smoking cessation. 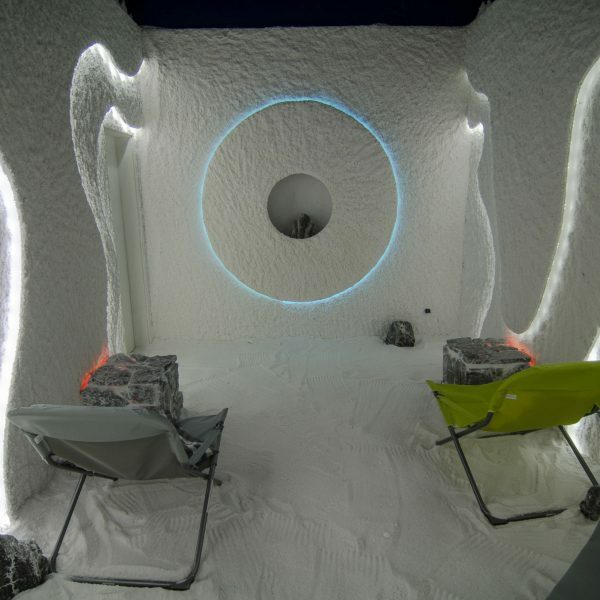 Salt room therapy, combined with infrared rays, is recommended for chronic fatigue and depression. Negative ions and long-wave infrared radiation affect the nervous system by reducing stress, relieving headaches, increasing energy, and generally improving the health condition of visitors. SALT ROOM THERAPY SHOULD NOT BE CONSIDERED AS A SUBSTITUTE OF PROFESSIONAL MEDICAL TREATMENT. IF YOU HAVE SERIOUS HEALTH PROBLEMS, YOU MUST CONSULT YOUR DOCTOR FIRST BEFORE COMMENCING SALT THERAPY. AS WITH ANY OTHER NATURAL THERAPIES, DO NOT EXPECT A MIRACLE AFTER ONE SESSION AT A SALT ROOM. TAKE A LOOK AT THE SUGGESTED VISIT SCHEDULES AND CHOOSE THE ONE THAT SUITS YOU MOST. Preventive care sessions two or three times a year (September – October, December – January, March – April) with 8 to 10 salt room visits every day or every other day. 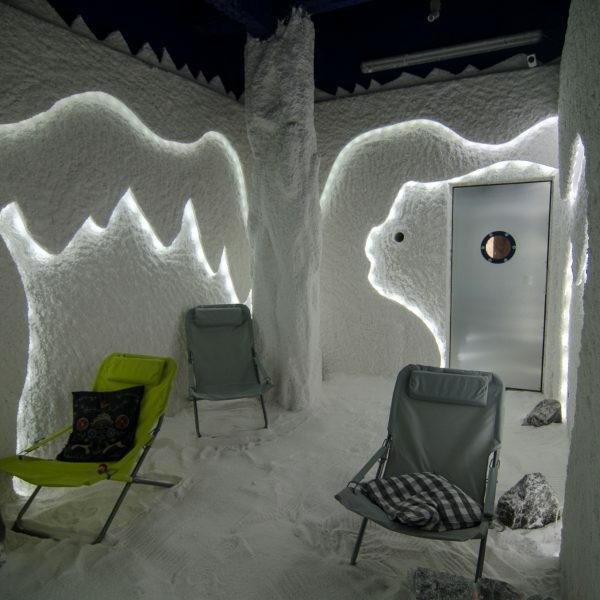 In cases of asthma, bronchitis, after acute respiratory diseases, skin diseases, depressions and other conditions – 15 salt room visits every day or every other day. The rates for our salt rooms include unlimited consumption of ionized water, as well as the beneficial effects of infrared rays. 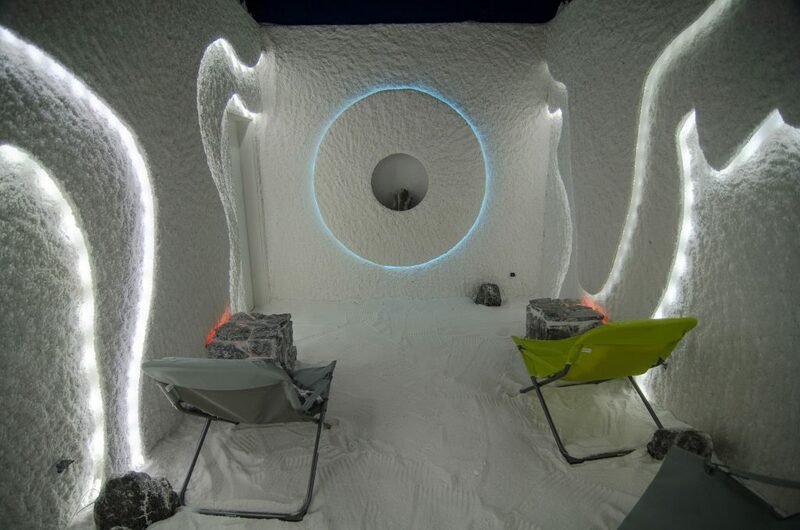 Book the whole salt room for 1 hour – 80 BGN The room capacity is 8 people. If you want to be alone in the room, you can pay an additional fee of 10 BGN per visit. One time visit – 15 BGN Children up to 10 years of age are always must be accompanied by an adult who enters for free. 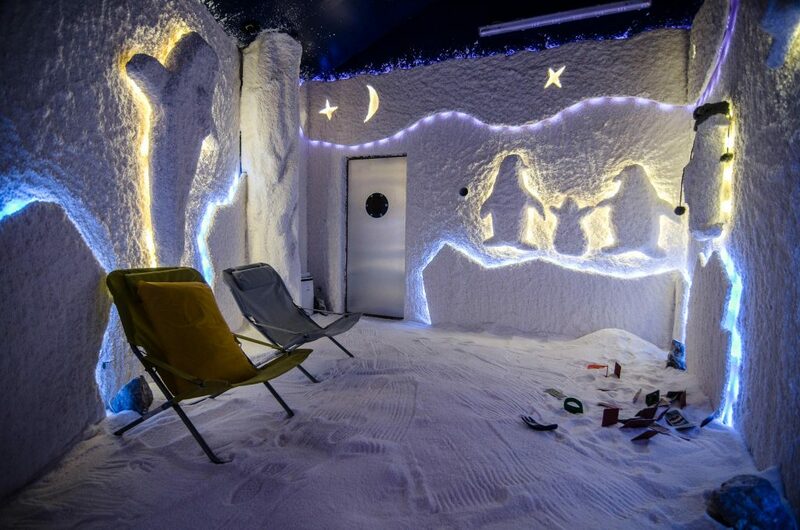 Book the salt room just for you for 1 hour – 80 BGN The room capacity is 8 people. 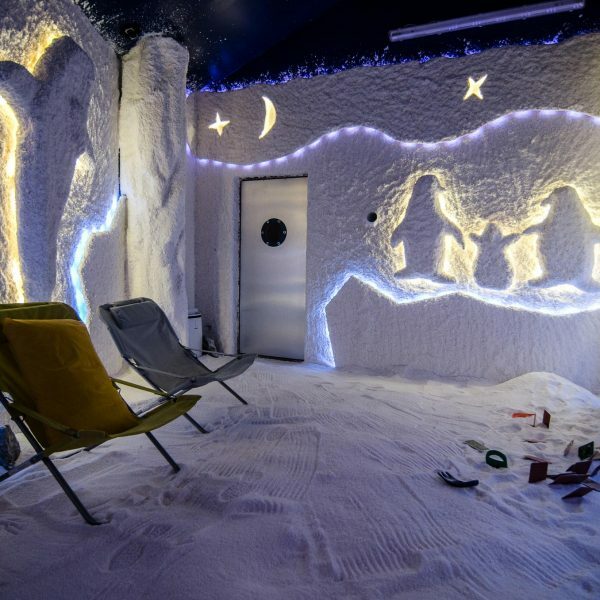 Enter the salt room without shoes. We provide slippers or a disinfectant spray if you want to go in barefoot. It is advisable not to use heavy perfume or cologne before visiting the salt room. 1. Could you use any other type of salt different from rock salt? No. Sea or Himalayan salt have unstable chemical composition and no clinical studies have been conducted with them. They may contain various impurities and additives such as clay, Iodine, etc., which have harmful effects on the respiratory tract and can cause bronchospasms or allergic reactions. 2. Do these salt rooms have the same benefits like those made of salt bricks but without a halogenerator? Scientific research shows that only salt rooms equipped with a suitable halogenerator can produce an aerosol that has a beneficial effect on the respiratory system, skin and immunity. 3. How are our salt rooms different and more effective than other? Our halogenerators are a 3rd generation with bi-directional inflows, operating on the principle of the “fluidized bed”. 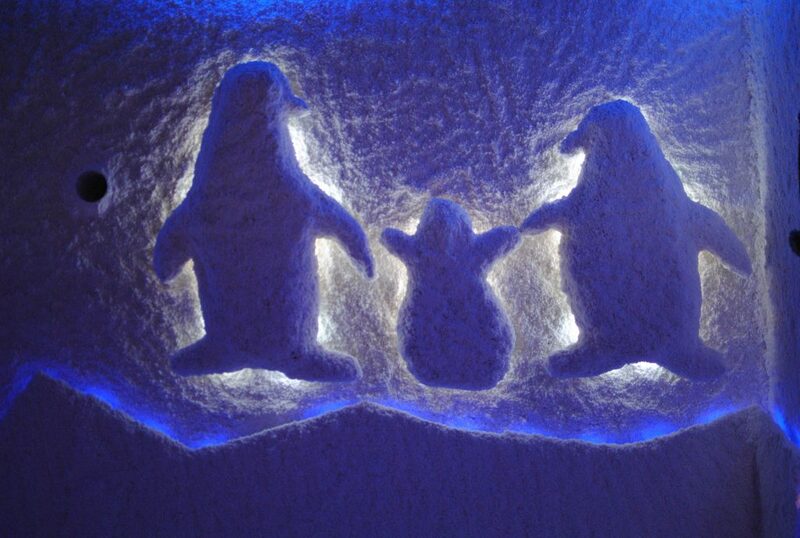 Our salt rooms are equipped with special infrared lights which simulate the environment of salt caves. We control the salt particles saturation, humidity, temperature and air purity in the rooms. We have a two-way air filtration which allows for maximum control when we talk about the sterile environment in the rooms. We use only special high-quality hermetically closed capsules of pure rock salt. We offer a cosy space for relaxation outside the salt rooms, where you can relax before and after the salt therapy. There is a bar with good coffee and teas, as well as ionized water. 4. Is breathing in humid aerosol bad for your health? Yes. Studies have shown that inhalation of wet aerosol causes complications in patients with bronchial asthma. In our rooms we have a two-way ventilation system and powerful dehumidifiers. 5. Could we contract an infectious respiratory disease if we stay in the salt room with an infected person? No. Thanks to our system for air purification and the saturation of salt particles in the air, the environment in the salt rooms is completely sterile and does not allow transmission of viruses from one person to the other. 6. What should I wear in the salt room? There are no special requirements. Just wear something comfortable. It is advisable to wear short sleeves or even a swimsuit if you are using the therapy to treat a skin problem. There is a changing room here where you could put something else on if needed. 1. In what cases are the infrared rays bad for you? 2. Are infrared rays dangerous? Infrared rays do not have any harmful effects on the living organisms. The infrared rays of the sun warm up the Earth from the dawn of its creation. 3. Is infrared light harmful for your eyes? No. Infrared radiation does not irritate the eyes and does not harm eyesight. It actually protects the skin and improves blood circulation.